Workspaces are best described as Natural language understanding (NLU) modules. These modules can be included in your app, website or services. These help translate user requests into actionable data. A workspace can be thought of as a place where the user journey for different scenarios are described. It includes the training data for AI engine and workflow to execute the actions. The tranlation from user's request to response starts with matching it to a particular intent. The matched intent then goes through a workflow based on the use case. The response can be simple text or a template. Query - User tries to enquire about a personal information. Example: "what is my balance"
Transaction - User is trying to perform an action. Example: "send 50 to amol"
FAQ - User is requesting from a knowledge base. Example: "What is neft?" Smalltalk - General chit chat to bootstrap the conversation. Example "good morning"
The first step in creating the conversation user experience is to identify the different use cases that the bot needs to support. Each intent can define one or more actions. Please check the Workflow section to define actions. Entities are mechanism for identifying and extracting useful data from natural language inputs. While intents allow your workspace to understand the motivation behind a particular user input, entities are used to pick out specific pieces of information that your users mention — anything from person names to product names or amounts with units. Any important data you want to get from a user's request will have a corresponding entity. Acronyms are custom ways to provide alias to certain words to improve the vocabulary of the bot. Webhook is the code that's deployed as a webhook that lets your workspace call business logic on an intent-by-intent basis. During a conversation, fulfillment allows you to use the information extracted by triniti.ai's natural language processing to generate dynamic responses or trigger actions on your back-end. To generate dynamic responses based on information looked up from a database. To place orders based on products a customer has asked for. To implement the rules and winning conditions for a game. These are polite conversation about unimportant or uncontroversial matters, especially as engaged in on social occasion. These help to interact with users informally before getting into real conversations. Cognitive QnA is our specific cloud-based API service that creates a conversational, question and answer layer over your data. Cognitive QnA enables you to create a knowledge-base(KB) from your semi-structured content such as Frequently Asked Question (FAQ) URLs, product manuals, support documents and custom questions and answers. The Cognitive QnA service answers your users' natural language questions by matching it with the best possible answer from the QnAs in your Knowledge base. The easy-to-use web portal enables you to create, manage, train and publish your service without any developer experience. Once you build your workspace on triniti.ai, you can use our channel integration tools to make your workspace available on multiple platforms. 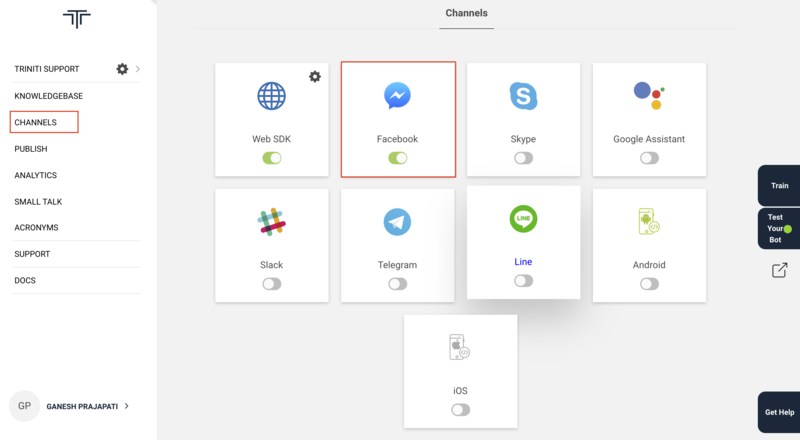 triniti.ai's one-click integrations help you manage the integration of your workspace with the Google Assistant, Facebook messenger bot and a number of popular messaging platforms, such as Slack, Skype... .